Don’t wait until it’s too late; even small chips and cracks should be repaired right away. Here are four good reasons to have your windshield professionally repaired as soon as possible. Four reasons why it’s important to have your windshield repaired as soon as possible. Comprehensive car insurance should help you fix scratches or cracks. Plus, if windshield damage is the result of an accident, your collision insurance should cover the cost of repairs and it may be possible to have the deductible waived. Having a crack or chip fixed right away can prevent it from spreading and either becoming more expensive to repair or requiring a full glass replacement. In most cases, the expense of repairing the damage is significantly less than that of replacing the windshield. Read more about Repairing vs. Replacing Car Glass. Our technicians know how to verify if repair work will be sufficient and ensure that the windshield will be able to hold up to regular wear and tear and extreme conditions after it has been fixed. Anthony Volk provides a guarantee for all of our repair work. Even small areas of damage on your windshield can decrease visibility for the driver or become a distraction. Larger cracks and chips present further safety issues as they can compromise the integrity of the glass and its ability to protect occupants of the car in case of an accident. Read more about safety concerns and driving with a cracked windshield. 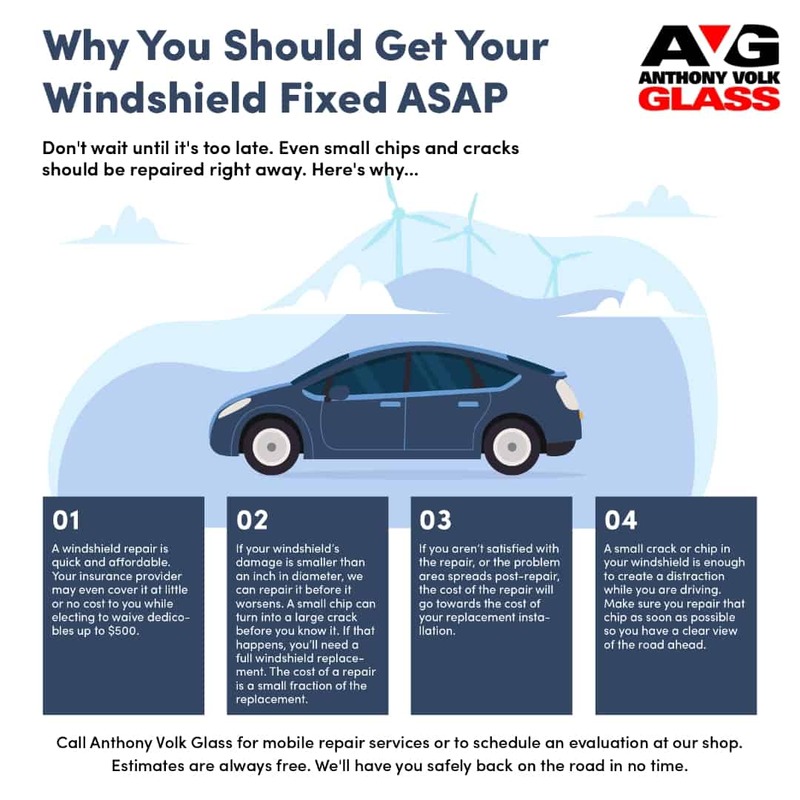 If you are dealing with a damaged windshield – whether it’s a chip, small crack, bullseye or spider crack – contact Anthony Volk Glass to have the windshield repaired as soon as possible. The cost for average repairs is about $70, which is a significant savings when compared to the price of glass replacement. Call our shop at (610) 436-9727 or fill out the easy quote request form.